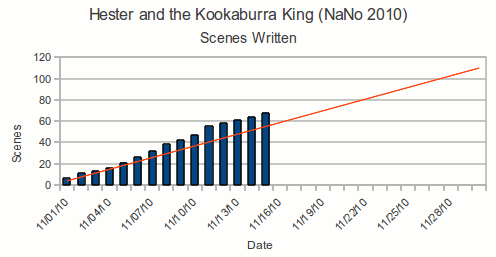 Day 26 and I have won NaNoWriMo 2010! National Novel Writing Month for 2010 is now official over for yours truly. So I may have passed the requisite 50,000 words back on November 12th, but today, I have finally finished my first draft of Hester and the Kookaburra King. My final official word-count was 100,227 words. Check out my NaNoWriMo user profile if you don’t believe me! Don’t worry, I’ll have a more nerdy breakdown of the month’s progress at the end of the month. I have lots and lots of data. Time to go read something for a change. Yesterday marked the midpoint to the madness of National Novel Writing Month, which means you need to be at 25,000 words to be at par with completing on November 30th. Now of course, even though I already passed the magical 50,000 word threshold last Friday, I’ve still got plenty of writing ahead to finish the first draft of “Hester and the Kookaburra King”. As you can see, so far I’ve been able to maintain pace and keep a decent buffer of scenes ahead of me. I’m very satisfied with my plan to write my outline last month, as it front-loaded a lot of the headaches of trying to decide where the story should go next. I haven’t had to worry about writing myself into holes, and overall it’s given me more time to just spill words onto the page. More so, because I didn’t outline every single detail, I’ve had plenty of opportunity to modify the outline as necessary, without having to worry about upsetting the overall balance of the book. By outlining just the core plot elements that I need to drive the plot, I’m free to provide as much “flavor” to a scene as I want. So far, some of my favorite scenes only barely meet the outline’s bar, allowing things to happen that I never would have imagined last month. Also, I’m finding that this year my preferred writing domain has changed. My first two years I wrote the most during my bus commute, listening to music blaring in my headphones. When I did write at home it was on my couch and coffee table, or if I was “serious” on my desktop. I even resorted to using tools like my PunishPad in order to boost my word count. This year, even though I still write a little on the bus, or on my lunch break, I get the majority of my writing done at home sitting up in bed. When I’m out I listen to music just to drown out any distractions, but at home I prefer silence, and sometimes I even wear earplugs. I aim to hit the 1667 quota by 8:30pm, and then I’m under the covers, and until midnight I’ve got my head down in FocusWriter, tapping away. Anyway, here’s 423 words that could have gone toward my novel. Better get back to writing! It’s been about a week since I once again joined the fast typing, never-say-delete madness that is National Novel Writing Month. As of this morning, I’ve completed 26 of the 110 scenes that I planned out in October. 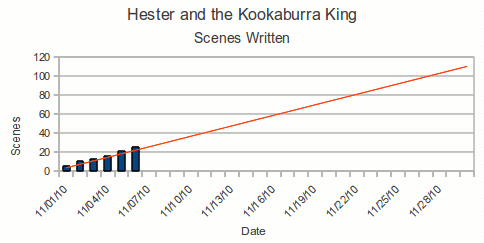 So by that metric I’m 24% complete with Hester and the Kookaburra King. ﻿I’ve gotten into some good flows over the past few days, but ultimately I can’t but feel like I’m always behind. I’m a notoriously slow typist, and though I’m confident I’ll hit the 50k and win NaNo, my real goal is to finish the book before the end of the month.